Back on July 19 I wrote about Young Rising Sons in advance of its debut EP which dropped a few days after (July 22) and met with success. The Red Bank, New Jersey natives had a breakthrough 2014, and “High,” the band’s first single, is the crowning achievement for a year that featured several television appearances and an ongoing U.S. tour with The 1975. “High,” which you may have heard before (it’s been making its rounds), begins with a sweet whistle followed by lead vocalist Andy Tongren’s effortless vocal. What makes this song? Did you get to the Mika-like chorus yet? Tongren’s falsetto is sweet and uplifting. The whistle is a bit Noah and the Whale-esque. The song is just a testament to the band’s efficacy. I can’t stop listening to it. While that does sum it up, I will add a bit more laudatory comments to the band’s praise repertoire. Look, the song is clearly catchy. It’s actually more than catchy; it’s downright impossible to get out of your head. Seriously. It has been stuck in my head since July. But, aside from this inherent catchiness, it is also a masterful piece of pop. 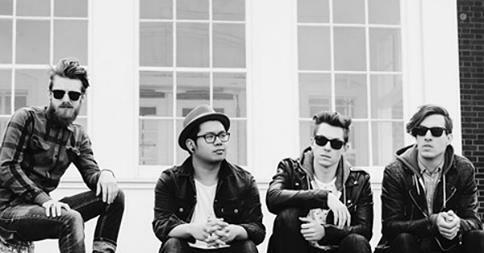 Young Rising Sons combines all necessary components for an effective pop tune. First, it is short, a sub-3 minute ditty that says what it has to say and then ends so the listener can immediately press repeat. Secondly, it features an upbeat, sing-a-long vocal that quite literally makes the listener sing (or hum). Most importantly, though, the song has an infectious hook. And, come on, it features a great whistle as well. It’s just a perfectly constructed song and well deserving of #5 on our countdown. Check out the band’s website, Facebook, and Twitter.